The Skinny: A messy story and uninspired exposition weigh down Blade of Fury, but the action and emotions are solid. Not a perfect film, but an enjoyable one. by Kozo: Sammo Hung directs Blade of Fury, an enjoyable, though somewhat messy martial arts film mixing political intrigue, questionable performances, and balls-to-the-wall martial arts choreography. Martial arts master Wang Wu (Yeung Fan) was once captain of the "Black Flag Troop", a group of sword-wielding martial artists bent on expelling imperialists from China. After a tragedy leaves him the lone survivor of his troop, Wang goes into self-imposed exile, only to be discovered and brought back to the world by government official Tan Tzu-Tung (Ti Lung). With the help of Tan, Wang sets up a martial arts school at the capital. Wang's nationalism comes to the fore when he joins Tan Tzu-Tung in a plan to get rid of the Empress Dowager in order to restore China to greatness. However, their plan is countered by those who don't seem to mind a little thinning of their nationalist pride. Betrayal occurs, sides are chosen, and IT ALL GOES TO HELL. Fighting erupts, people die, and heroes are born. Blade of Fury's energetic fight choreography immediately earns it a place among the more enjoyable genre films of the nineties. The action is frequently undercranked and sometimes over-the-top, but it's exciting stuff that flows fast and furiously. The cast is a mixture of fighters trying to act and actors trying to fight, and for the most part, it works, though there are a few debits. Some of the actors aren't very charismatic, and Rosamund Kwan is wasted in a mystifyingly small flower vase role. Still, lead Yeung Fan shows steely presence, Ti Lung brings power and integrity to the pivotal role of Tan Tzu-Tung, and Cynthia Khan and Collin Chou (AKA: Ngai Sing) turn in fine support. 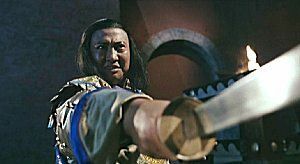 Sammo Hung only has a small cameo as a palace guard, but his quick duel with Yeung Fan is a highlight of the film.